Welcome to my first every Slow Cooker Saturday. Oooh...Are you as excited as I am? Slow cooker meals and I don't know each other as well as I would like. In the past, I have struggled to find recipes that I enjoy and like serving to my family. The ones I do like, my tried and true slow cooker recipes I have already shared on the blog. Like French Dip Sandwiches, Mango Chicken with Coconut Rice, Rootbeer Pulled Pork, Chicken Enchilada Soup, and Tex Mex Shredded Pork Burritos. I am hoping to try some new ones and on Saturdays I will share the ones that we have loved. Another perk about Slow Cooker Saturdays is that when if you see a recipe that looks good, you can check your pantry, run to the store, and put it on the menu for Sunday. 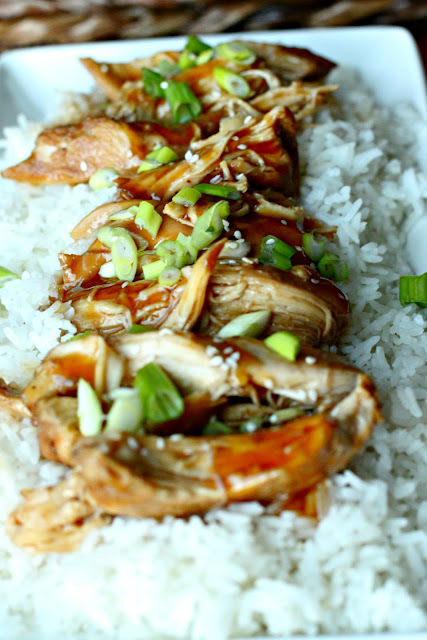 Slow cooker recipes make for perfect Sunday meals. 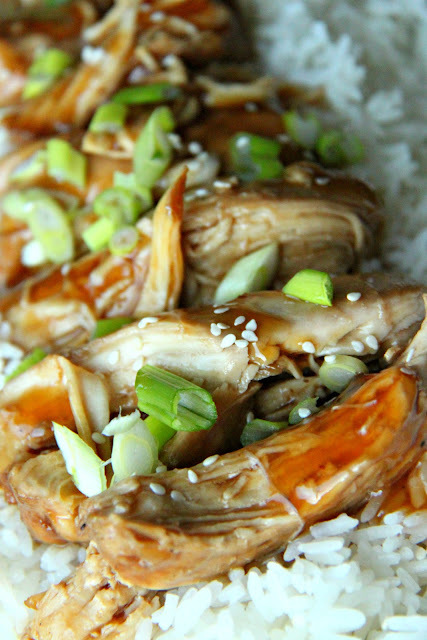 On this the first Slow Cooker Saturday, I am sharing this recipe for Teriyaki Chicken, which was, if I might say, to.die.for. The Teriyaki sauce was insane. Insane I tell you. I may or may not have "quality checked" like a fourth of the chicken before we even had dinner. When all the chicken had been dished up and eaten I asked my Little Men for the thumbs up or the thumbs down. There were absolutely no thumbs down. This Momma's dream come true. A yippee dance ensued. So basically, I am pretty sure I recommend this recipe. Place the chicken into a slow cooker. In a bowl, combine the sugar, soy sauce, vinegar, ginger, garlic, and pepper. Whisk until the sugar is dissolved. Pour the mixture over the chicken. Cover and cook on high for 3 hours then turn the chicken over and cook for 1 hour on low. Remove the chicken from the liquid and tear the chicken into smaller pieces, but do not shred. Cover and keep warm. Strain the liquid from the crock pot into a sauce pan. Whisk the cornstarch and cold water in a small bowl. Bring the sauce to a boil and then slowly whisk in the cornstarch mixture. Continue to heat the sauce until it thickens. Pour some of the sauce over the chicken to evenly coat. Serve chicken over rice and top with more teriyaki sauce. I hope you look forward to more slow cooker recipes and are as excited as I am to expand my slow cooker recipe box. Now, I don't want you to think that because I am including another recipe posting day that the blog is turning into a recipe blog. The blog will continue to have project, parties, sewing, and such. I mean a girl can't give up her sewing machine now can she? In fact, I have a couple of projects currently in the works that I am hoping to share with you next week. Thanks for being the best readers! Oh...if you have any favorite slow cooker recipes, I would love for you to share them! Just drop me an email. This sounds awesome! I use my slow cooker all the time....I LOVE it! I can't wait to see what other recipes you find. YUM looks amazing. I don't ever use my slow cooker and I really don't know why. Stella, you gotta hook me up with your favorite recipes! That was me forever too. This recipe is on my menu for Monday. I love using my slow cooker. Thanks for doing this. Ooh I know you will like it. Making this today! Thanks for posting it! I love slowcooker recipes, too. I have a Crock Pot board on Pinterest with some yummy things...feel free to check it out. Is the chicken thawed or frozen? I can never remember to pull out my chicken before a crock pot meal! It was partially thawed...does that help??? Basically I never remember either, so I try to speed thaw it in a bowl of hot water for 10 minutes. Replace water then let it go for another 10. Then I cut it up in sections and put it in. Thanks for stopping by AND for following! You are grand. I love when people are inspired and pin from my blog. It makes my heart all warm and fuzzy! Oh, yum! That looks so good. And....yeah, I tend to do a lot of quality control checking of dinner, too! Your blog is really fun. Thanks for your sweet comments about my robot quilt. I really appreciate it! That looks really amazing. I need to try something new in my crock pot. Just put the chicken in the fridge to thaw and be ready for tomorrow night's dinner. I LOVE your recipes and cook them often. Just pulled out your chicken enchilada soup recipe this morning to make this weekend. I don't use my slow cooker enough, so this will be great! Am going to make this on Sunday, it looks so good! I have a great shredded beef taco recipe that I'll email you, it's delish. Corrie, got it. Drooling already! Made this for dinner tonight, it was a hit. Thanks! Melly, I am SO glad! We had this for dinner tonight, Larissa, and it was really good! Everybody liked it, so I'll be using this one again. I'm super excited about more crockpot recipes! I always want to use my crockpot more, but it helps to have a recipe that is recommended by someone I trust before trying them on my family. Wow, it makes me feel hungry! Yay Sarah. I am glad I didn't let you down. Tomorrow I have another yummy recipe! Bookmarked this to put on my meal plan for next week! 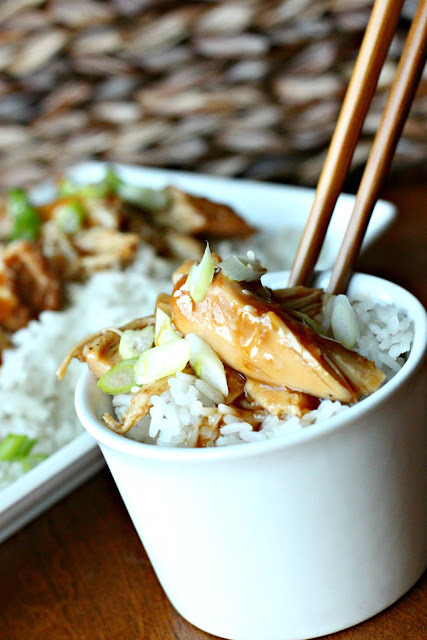 We love chicken teriyaki and I love that this is a slow cooker version. Oh and when you tell me that the sauce is "insane," how can I NOT try it?!? Can't wait to taste it. I hope the recipe worked for you! Looks great! I definitely have to try this. 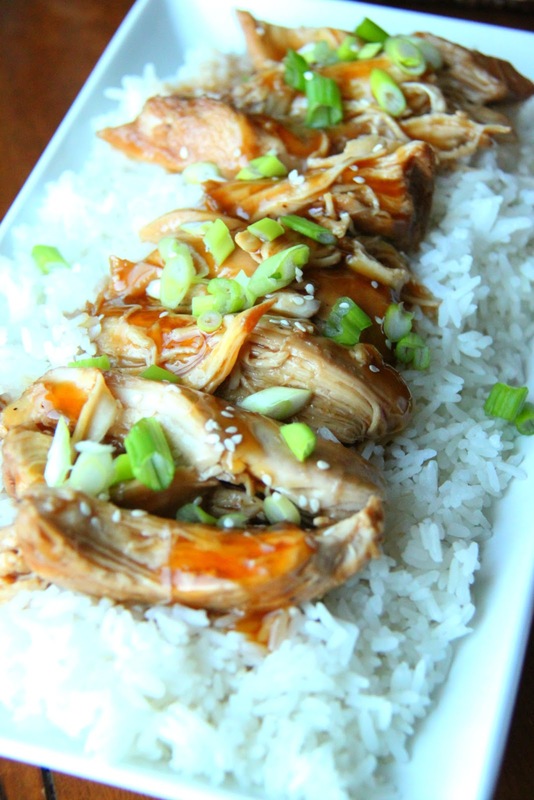 My kids love teriyaki chicken! What sugars did you use?